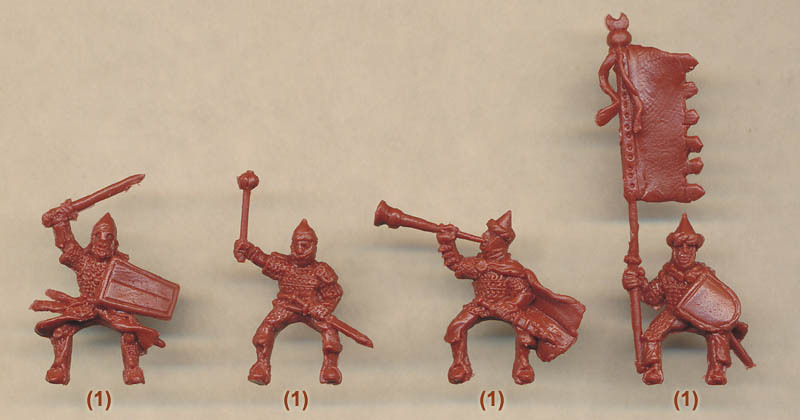 In the Muslim world the medieval mounted warrior was overwhelmingly a bowman, highly skilled at using his weapon either standing or on the move, so why are there no archers in this set? Well, just as with any other large region the Muslim world was made up of different races and peoples with different traditions, and most Arab cavalry, particularly that of the Fatimid Caliphrate of Egypt (prior to its absorption into Saladin’s empire), used a variety of weapons little different from that of western Europe. This set then, while not typical of Muslim cavalry of the time, delivers an interesting and unusual feature of the forces of Islam. The principal weapons were the spear, sword, axe and mace – all of which are to be seen in this set. The early period for these figures means the curved scimitar had yet to make its appearance, so the swords are straight or only slightly curved. Two men have a spear, but this was light and not used couched under the arm like the Europeans, so these figures are fine. Swords and maces were always popular and those here look OK too. The evidence suggests bows were rarely if ever used by Arab cavalry, although one bow case has been supplied for attaching to the saddle. Clearly if this is not desired it is a simple job to omit it and trim off the peg. The nature of their weapons meant these men were usually better armoured than the co-religionists. Mail and lamellar armour were common, but lighter armour or none at all is also possible. All the figures in this set have armour – mostly metal – but the style looks fine, as does the variety of helmets, some with turbans wrapped round them. While round shields seem to have been the norm many other designs are also known, with influences coming from both east and west, so the wide selection on show here seems appropriate. Other clothing such as cloaks is pretty accurate, so there are no accuracy problems. The poses are the fairly standard bunch and there is not much wrong with any of them though they are not particularly exciting (which many will see as a good thing). Muslim armies made a lot of noise to unnerve an enemy, so the trumpeter here is a good choice. The banner man carries one of many likely designs of banner, which is not engraved here but would probably carry quotes from the Qur’an. In our humble opinion Strelets have always struggled with horse poses, and much the same story presents itself here. Three of the poses are fine but the other three are very unconvincing or worse. Unlike their riders most such horses were not protected, so these have a very suitable array of saddlery and decorative items. Two of the poses have a peg on the left side to take a supplied bow or shield (we have placed a bow on one in our photographs). The familiar style of Strelets sculpting is repeated in this set, with fair detail if rather basic at times. Where weapons and shields are separate (which is rarely as most figures come complete) the accessories fit the peg or ring hand well, and there is a complete lack of flash. Proportions are OK though the poses tend to be fairly flat, with arms generally being exactly in line with the trunk of the body – easier to mould but a bit dull. This is another competent set from Strelets, where what the figures lack in refinement they make up for by excellent historical accuracy. Many Muslim armies of the early medieval period will need some of these men.